Firefighters doused the blazing Tesla Model X's battery pack, and then company engineers removed about one-quarter of its power cells before the vehicle was deemed safe to tow off a California freeway. That didn't prevent the powerful and highly flammable lithium ion battery cells from reigniting. The car caught fire twice more within 24 hours of the March 23 fatal crash, and again six days later, according to a safety bulletin from the fire department in Mountain View. Fires on electric vehicles are rare, but the volatile chemistry of their batteries and the need for special training on how to extinguish them raises new safety questions as automakers are poised to dramatically increase production. Techniques for putting out burning gasoline-fueled vehicles could worsen a blaze in a battery powered one. "We're in uncharted waters here," said Donald Sadoway, a professor of materials chemistry at the Massachusetts Institute of Technology. "When you start putting 70 kilowatt-hour packs in a car, it's very different than what happens in a cellphone." The growing popularity of lithium-based batteries that power everything from personal electronics to bicycles has periodically been marred by outbreaks of fires. Blazes in e-cigarettes, laptops and even battery packs on one of the most sophisticated jetliners in the world, the Boeing Co. 787, have led to government restrictions and frightening headlines. The U.S. National Transportation Safety Board has opened investigations into two recent Tesla fires, along with an earlier blaze last year. The agency charged with setting vehicle safety standards, the National Highway Traffic Safety Administration, on Thursday announced it was also gathering information on the most recent episode, on May 8 in Fort Lauderdale, Florida. Swiss police are also examining a fatal Tesla crash last week that triggered a fire. The issue isn't new. NHTSA also has conducted reviews of battery fires in the past, including a Chevrolet Volt that caught fire in 2011, several weeks after the agency conducted crash tests on the vehicle. Other manufacturers whose cars have been involved in fires include the former Fisker and Mitsubishi Motors. The components of lithium ion rechargeable batteries make them inherently fire-prone. Unlike gasoline, which needs a spark before it ignites, lithium cells contain their own ignition systems: large stores of energy that are transformed into heat and sparks when they short circuit. They also contain solvents that are powerful fuel for fires as well as oxidized metals that can feed oxygen to a blaze, complicating efforts to extinguish it. "This is a perennial problem with lithium ion batteries," said Prashant Kumta, a University of Pittsburgh engineering professor who has studied battery chemistry. While the battery industry has made huge strides in ensuring cells can perform safely during normal operation and recharging, little can be done once cells are torn apart in a violent collision, Kumta said. In a phenomenon known as thermal runaway, a short-circuiting battery produces ever more heat, which creates a chain reaction of fire and more heat production in adjacent cells, he said. "It's basically like a firecracker," he said. "You have one battery that catches fire, then the next one catches fire and pretty soon they're all on fire." There were 174,000 fires on all motor vehicles in the U.S. in 2015, killing 445 people, according to the most recent data from National Fire Protection Association. The attention paid to the relative handful of Tesla fires compared with the thousands of other automobile fires has rankled the automaker. The risk of a gasoline-powered car catching fire was more than four times higher than a Tesla Model S, CEO Elon Musk wrote in a 2013 blog post. "You are more likely to be struck by lightning in your lifetime than experience even a non-injurious fire in a Tesla," Musk said. The company didn't respond to a request for comment on the recent episodes. In a 2011 press release, prompted by the Chevrolet Volt fire, NHTSA said it did not believe EVs were more susceptible to blazes than other cars. After that fire, NHTSA conducted a series of tests on Volt battery packs. Out of six simulations of various types of accidents, two of the batteries caught fire, according to the agency's report. A search of crash records at the time found no evidence of other fires. 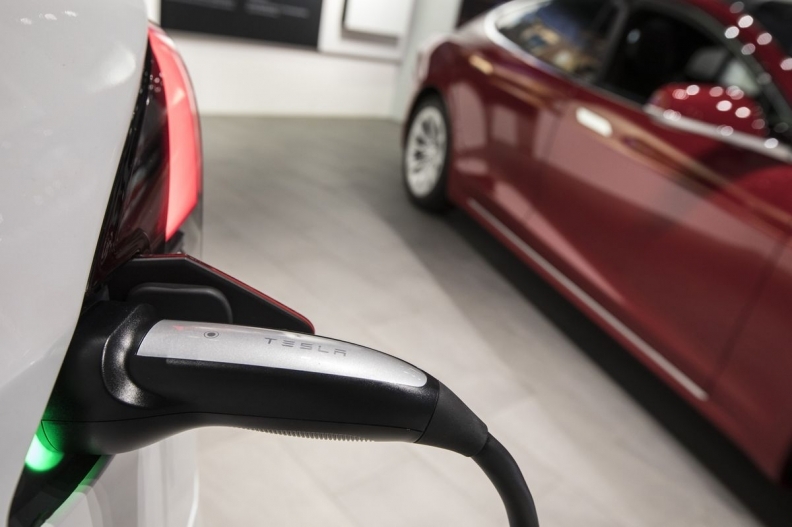 However, there is little government data on the occurrence of EV fires, making it difficult to document the extent of the problem, said Jason Levine, executive director of the advocacy group Center for Auto Safety. "One of several troubling things about these fires is a real lack of usable, quantifiable data that would help everyone involved," Levine said. Not only is it difficult to compare electric vehicles with gasoline-powered ones, it's also impossible to compare the likelihood and severity of fires on Teslas with those on other lithium-battery-powered cars such as the Chevrolet Bolt, Nissan Leaf and BMW i3, Levine said. One fact that is not in dispute is the intensity of fires that occur in large lithium ion battery packs. Firefighters in Indianapolis who responded on Nov. 3, 2016, to a crash of a Model S that hit a tree and a building at high speed encountered what looked like a fireworks display as battery cells exploded and shot into the air, according to video shot by a news crew. The crash killed both people in the car. In the Fort Lauderdale Tesla crash, two teenagers died and a third was injured when the car struck a concrete wall and burst into flames, according to police. Video of the scene shows fire engulfing the Model S.
"NTSB has a long history of investigating emerging transportation technologies, such as lithium ion battery fires in commercial aviation," NTSB Chairman Robert Sumwalt said in a statement announcing the agency was opening an investigation. When the Model X in Mountain View slammed into the side of a concrete highway barrier, the front of the car was sheared off, damaging the battery pack under the floor. About half of the car was on fire when crews arrived, said Chief Juan Diaz. It took about two minutes to extinguish the blaze, he added. The driver, Walter Huang, was killed. Mountain View is in Silicon Valley, where EVs are common and firefighters trained for battery fires at Tesla's nearby factory in Fremont in 2014, the chief said. Still, the case illustrates how fire departments may need more training on the unique problems created by battery fires. The fire crews used water mixed with chemicals that create a foam designed to snuff out gasoline fires, according to Diaz and photos of the scene. However, foam isn't recommended by the National Fire Protection Association for batteries. NFPA guidelines call for using copious amounts of plain water on battery fires, as much as thousands of gallons. The water helps cool the battery, which is key to halting a fire. Concerned that the battery was continuing to generate heat and worried about the risk of electrical shock, the firefighters called in Tesla engineers -- which may not be possible if accidents aren't as close to the company's factory. They removed about 25 percent of the battery's cells, Diaz said. Fire crews accompanied the tow truck that brought the car to a salvage yard because the battery continued to pop and hiss as gas vented from the power pack, Diaz said. It didn't reignite on the trip, but it caught fire again two more times within the next 24 hours and again six days later, Diaz said. A crew had to drain the remnants of the battery of any electrical charge before it became safe, he said. Scientists are working on promising lithium ion battery formulations that will reduce the chances of fire and there may be ways to make battery cases more impact resistant, said John Warner, a consultant who is president of the National Alliance for Advanced Technology Batteries International, a trade group. But until then, there needs to be more education for firefighters and other emergency workers, Warner said. "It is a relatively new technology from what the firefighters have dealt with in the past," he said. "I think there's been some very good work done. Has it reached every fire department in the United States? I'm not sure it has."